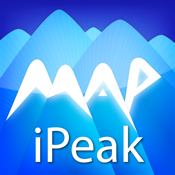 The Application iPeak is an information guide for ski resort, which provides the function of collecting statistics, GPS navigation. Navigation - locate the application's user iPeak relatively to other objects (e. g, runs, lifts, restaurants, hotels and "friends"). Map – the drawing map of resort. Statistics - the application provide users of iPeak with: their speed, distance traveled and conquered heights over a given period of time. Slopes - information about slopes and lifts (length, location, etc.). Restaurants - Restaurant details (description, contacts, photos, location map). Hotels - Hotel information (description, contacts, photos, location map). Webcams - information from cameras at this site resort. The Application iPeak is developing and improving. We will be grateful for your comments and any information that will help us to enhance the service and functionality.